PoultryProcessingEquipment.com manufacture and supply a comprehensive range of refrigeration and freezing systems used in automated poultry processing factories. Most solutions are tailor-made to suit the client's individual requirements depending upon volumes and product types. 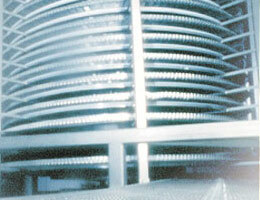 Our spiral freezing systems have been specifically developed for chicken portions.